Editor’s note: Today it’s my honor and privilege to present an article by guest author Beverly Voth, whose contributions to the FileMaker community are numerous and much appreciated. It’s great to have her back here on FileMaker Hacks. FileMaker 13 & 14 have some features that can be leveraged to allow one layout to toggle between Form View & Table View and look differently! We will be using the Starter Solution, “Contacts”. Feel free to download the demo file (Contacts14.fmp12.zip) or you may start with a fresh copy of the database file or another Starter Solution and follow the steps below. NEW to Starter Solutions? Select “New From Starter Solution” under the File menu. Click the “Contacts” icon and click on the “Choose” button. A dialog will come up with the “Save As” field filled in with the name of the database file you chose. Navigate to where you wish to save the file and click the “Save” button. This will open the file to the default layout and be ready to change. The default layout for Contacts is “Contact Details”, is in Form View and shows two “tab-like” buttons called: Contact List & Contact Details. These are buttons that Switch you to different layouts. Notice how the placement is the same and there is a smooth transition between the two layouts. You may also notice that the view is “locked” to just allow View as List or View as Form (respectively). You cannot select other views on these two layouts. This entry was posted in Beverly Voth, Level: Intermediate, Version: FM 13 or later on August 22, 2015 by beverlyvoth. 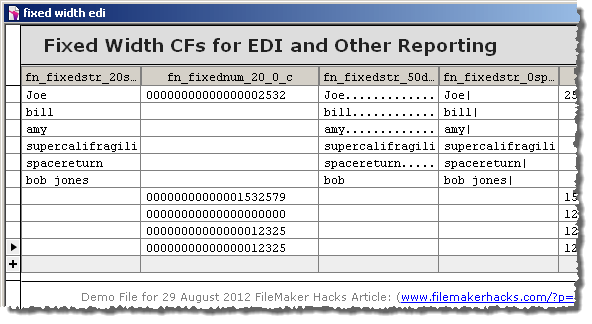 There seem to be many questions about the usage of SQL (Structured Query Language) with the ExecuteSQL function in FileMaker 12. This tutorial attempts to explain some of the SQL terms, if you are new to writing SQL statements. Since there are already many examples of how to write the ExecuteSQL queries, links to these will be listed at the end of this article. If you don’t need to learn the terms, jump right to the Helpful Example Databases section, below. There you will find links to solutions that help you create and test your queries. This is not a complete SQL guide, as other databases may use other syntax. This is not a complete FileMaker and SQL guide, as FileMaker may be an ODBC source and the SQL queries made against it may vary from the terms used by ExecuteSQL(). This is not a complete FileMaker and ESS guide using SQL calls (if using Import or Execute SQL script steps or ExecuteSQL() function or ESS). It may not have all the nuances needed for other data sources. This is the ExecuteSQL() function reference for which you’ve been waiting. The FileMaker 12 ODBC and JDBC Guide is helpful, but it has uses outside (and beyond) the ExecuteSQL() function. Any discrepancies between the reference and the function will be noted here, if possible. This entry was posted in Beverly Voth, ExecuteSQL, SQL and tagged ExecuteSQL, SQL on October 19, 2012 by Kevin Frank. This recent topic led me to consider what other aggregate fields could be used with the filtered portal. And what about that Go To Related Record script step? Does it only show the related FILTERED records or all related records? The demo (bvoth_aggregates_in_portals.fmp12) and article have been created to answer these questions. I started using filtered portals in cross-tab reports shortly after they were introduced. These are generally ways to show something very specific in each portal with sorts and filters and usually one row only. I had not explored the use of aggregates in these cross-tab reports until now. Kudos to those before me that may have discovered these answers and tricks, too. This entry was posted in Beverly Voth, ExecuteSQL, Level: Intermediate, Version: FM 12 or later and tagged Aggreate Functions, ExecuteSQL, Filtered Portal, FMP12, Portal Sorting, Summary Field on September 13, 2012 by beverlyvoth.